We’d love your help. Let us know what’s wrong with this preview of The Scandalous Sisterhood of Prickwillow Place by Julie Berry. There's a murderer on the loose--but that doesn't stop the girls of St. Etheldreda's from attempting to hide the death of their headmistress in this rollicking farce. The students of St. Etheldreda's School for Girls face a bothersome dilemma. Their irascible headmistress, Mrs. Plackett, and her surly brother, Mr. Godding, have been most inconveniently poisoned at Sunday d There's a murderer on the loose--but that doesn't stop the girls of St. Etheldreda's from attempting to hide the death of their headmistress in this rollicking farce. The students of St. Etheldreda's School for Girls face a bothersome dilemma. Their irascible headmistress, Mrs. Plackett, and her surly brother, Mr. Godding, have been most inconveniently poisoned at Sunday dinner. Now the school will almost certainly be closed and the girls sent home--unless these seven very proper young ladies can hide the murders and convince their neighbors that nothing is wrong. To ask other readers questions about The Scandalous Sisterhood of Prickwillow Place, please sign up. Is this suitable for young adult readers? Is this appropriate for a 10 year old reader? She reads well above her grade level but isn't into scary books. Jojo Yes. It's not really a very scary book. It's also not at all dark. It's silly. Comparable to a less dark Series of Unfortunate Events. Super cute! The plot is more-or-less a game of clue, but more MG-like, with a large cast of funny, resourceful, and charismatic young girls. Much like its cover, The Scandalous Sisterhood of Prickwillow Place is intriguing and fun with a touch of humour. We begin by being introduced to the girls with the help of some illustrations and a quick look into why they were sent to St. Etheldreda's School for Girls. I had the ARC so the illustrations were sadly missing, but the cover accomplished the sa Super cute! The plot is more-or-less a game of clue, but more MG-like, with a large cast of funny, resourceful, and charismatic young girls. Much like its cover, The Scandalous Sisterhood of Prickwillow Place is intriguing and fun with a touch of humour. We begin by being introduced to the girls with the help of some illustrations and a quick look into why they were sent to St. Etheldreda's School for Girls. I had the ARC so the illustrations were sadly missing, but the cover accomplished the same and it was fun to have a visual to go with all these great personalities. Then shortly after, we have the death of the headmistress and her brother, leaving the girls to solve a mystery while trying to hide the events from the townsfolk - which proves to be quite the challenge in such a small town full of nosy neighbours and visitors. While the plot is not especially hard to predict, the characters are what makes this entertaining. The girls range from tween to early teen, giving us an MG novel that is still a great read for adults. Plus, the novel is set in a time where kids that age seemed much older, married much younger, and had to be a lot more independent at a young age. So while they're very young, they're intelligent and capable, free of the usual angst and dramatics you might have expected otherwise. And do they ever have personality! I loved how quirky every girl is. They all bring something to this story: some with know-how that end up being very useful, others with rational thinking and social abilities to deal with the many dilemmas encountered. In addition, most of them have a sense of humour that proves to be the perfect touch to keep this novel from getting even a hint of a dark tone. The vibe is kept light-hearted and overall amusing throughout. Even adding in a sprinkle of romance now and again. The downside to having 7 girls as main characters, however, is that you're unlikely to find yourself connecting with them on a personal level - just keeping track of everyone can be a challenge - but it's not meant to be a deep, emotionally charged story at all so this doesn't become a major issue. Another thing I really enjoyed was the historical setting which is built to perfection. The atmosphere Julie creates is excellent; the descriptions of the girls, the dialogue, and especially the dynamics of the town truly breathes historical life into this novel. An adventure full of character and charm, The Scandalous Sisterhood of Prickwillow Place is as much about the mystery itself as it is about the friendship between these young girls. Nothing forms a tighter bond than covering up a murder together! An absolutely delightful Victorian farce in which a group of Victorian schoolgirls attempt to conceal the death of their awful schoolmistress and live in a sisterly utopia . . . and must therefore deal with the nosy neighbors, angry creditors, hopeful suitors, and suspected murderers who descend on them. Laugh-out-loud funny as well as tender, it made me wish my nickname was Smooth Kitty! Dark, witty, ominous, twisted, and absolutely hilarious! This was most definitely giving me Agatha Christie meets Arsenic and Old Lace vibes and I loved every moment of it. I do have to say that this was tad slow and there were romantic bits that didn't feel necessary to me, but what made up for that was that this was an amazingly entertaining read. I fell in love all 7 of these viciously twisted girls and was sad that this came to an end. This is also a murder mystery and I thought that part of Dark, witty, ominous, twisted, and absolutely hilarious! Dear Julie Berry: Thank you for writing this book. Thank you for writing such a fun and sassy story about girl friendship and mystery. Thank you for making all the girls actual friends, despite their differences. And thank you for writing such a romp of a tale! I loved every word of this book. Initial Thoughts: The girls at The St. Etheldreda's School for Girls find themselves in the unlikely position of being on their own after the poisoning of their headmistress and her brother. The story is both charming and amusing and written in the style of the historical period. The girls work together to solve the murders and while I kept thinking of Scooby Doo in my head, they did work out the details rather nicely. I found myself chuckling at some of the situations. The Scandalous Initial Thoughts: The girls at The St. Etheldreda's School for Girls find themselves in the unlikely position of being on their own after the poisoning of their headmistress and her brother. The story is both charming and amusing and written in the style of the historical period. The girls work together to solve the murders and while I kept thinking of Scooby Doo in my head, they did work out the details rather nicely. I found myself chuckling at some of the situations. The Scandalous Sisterhood of Prickwillow Place is both a charming and humorous book about seven young girls who reside at St. Etheldreda's School for Young Ladies. If you love historical novels with a touch of humor and silly situations, The Scandalous Sisterhood of Prickwillow Place is definitely a worthwhile read. 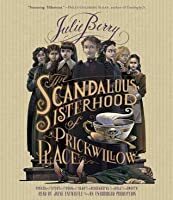 Written in the style of books from the turn of the 19th century, The Scandalous Sisterhood of Prickwillow Place follows these seven girls as they work to keep the school open following their headmistress' unfortunate death. During a Sunday dinner (at which the girls were to serve the meat, but not eat any of it), the headmistress Mrs. Plackett and her brother suddenly die at the dinner table. The girls are shocked at first, however they quickly figure out that if they call the authorities, they will be disbanded and sent either home or to another school. The girls hatch a plan where one of the girls Alice would masquerade as Mrs. Plackett and each girl takes on a responsibility to keep the school running. The girls take care of the bodies, burying them outside the school. Meanwhile, life continues (as well as social engagements booked by Mrs. Plackett prior to her demise). Some hilarious situations arise. The girls quickly realize that the killer is still out there and that Alice may be in danger, especially if the killer thinks Mrs. Plackett is still alive. The girl work together to figure out who is the murderer. At this point, I was reminded a little of Scooby Doo, but I like Scooby Doo, so all's good. The Scandalous Sisterhood of Prickwillow Place was an entertaining book to read. Those girls were brilliant! Highly recommended. I loved this book. It was delightful, from beginning to end. I was searching for how to classify it, and in the afterward, Ms. Berry mentioned the term, British Farce. And that's what this is. I am all for Girl Power, and this book is very much about girl power and the bond between girls/women. Not only is this a sisterhood bonding story, it's also a bit like Oceans Eleven, one of those caper-type stories where you have a disparate group of individuals who are thrown together under a common bond I loved this book. It was delightful, from beginning to end. I was searching for how to classify it, and in the afterward, Ms. Berry mentioned the term, British Farce. And that's what this is. I am all for Girl Power, and this book is very much about girl power and the bond between girls/women. Not only is this a sisterhood bonding story, it's also a bit like Oceans Eleven, one of those caper-type stories where you have a disparate group of individuals who are thrown together under a common bond. I'd call these girls the Scandalous Seven. You have Dear Roberta, Dull Martha, Pocked Louise, Dour Elinor, Stout Alice, Disgraceful Mary Jane and their de facto leader, Smooth Kitty. Each girl brings a different characteristic to the book, and I loved each and every one of them. I just wanted to give them all a hug (even Elinor, whose obsession was death was a little bit disturbing at times). Such a dark subject, a double murder at a quiet ladies school. However, Berry handles it with a deft touch. Instead of spending too much time dwelling on the horror of the girls' predicament, the reader is focused on how these girls react to it and take measures to prevent their sisterhood from ending prematurely. I like the way they work together, and despite the typical occasional squabbles among young women, they look out for each other and validate each other. I loved the humor. It was mostly subtle, but sometimes laugh out loud. It reminds me very much of British comedy with some British mystery thrown in. There is a nice dose of romance, because, well they are young women, and romance is often a factor. However, the youngest, Pocked Louise, could give a fig for boys. She's our resident sleuth, and a very smart sleuth she is and she thinks boys are foul. The other ladies, all seem to find guys who prick their fancy. Even Smooth Kitty, who thinks she's got everything all figured out. It thought it was so funny how big a flirt Disgraceful Mary Jane was, and a very unrepentant one at that! Deliciously dark and brilliantly farcical, I do love seeing nice girls get mixed up in murder! THE SCANDALOUS SISTERHOOD is a good read. I just don’t think it’ll be particularly successful with it’s target audience. The first thing that irritated me was the face that there’s an adjective in front of each girl’s name, every time their name is mentioned in the narrative. It gets old after just a short amount of time, and it’s really the only way you can differentiate the girls. I never ended up remembering whose name belonged to who, I just remembered them by their adjective. If you’re going THE SCANDALOUS SISTERHOOD is a good read. I just don’t think it’ll be particularly successful with it’s target audience. The first thing that irritated me was the face that there’s an adjective in front of each girl’s name, every time their name is mentioned in the narrative. It gets old after just a short amount of time, and it’s really the only way you can differentiate the girls. I never ended up remembering whose name belonged to who, I just remembered them by their adjective. If you’re going to have a lot of character, all of them need to be fleshed out to the extent their position as a main character or supporting character allows. Julie Berry just didn’t do that for me in THE SCANDALOUS SISTERHOOD. The second thing that was disappointing to me here was the premise itself, really. These are what–eighth grade girls? Not even that. They just saw their headmistress and her brother drop down dead in the middle of a meal, and these girls want to bury them and go on living like nothing ever happened? There’s no sense of compassion or humanity or what’s for the best. They’re immature at best, and any thought of telling anyone what has really occurred is glossed over in a matter of seconds. Those two things really turned me off from this book, and I don’t think that it’s slow narrative will appeal to middle-grade girls in the first place. However, there’s a lot of great Victorian themes here and I loved the way the girls had such a sisterhood with each other. Their friendships and banter was enjoyable also. There’s a lot of research that goes into a book like this, and Berry has definitely delivered on that account. I can definitely see this appealing to certain readers, but as a whole it just didn’t do it for me. Recommends it for: everyone, of course! When the irascible and cold headmistress of St. Etheldreda’s School for Girls literally drops dead at Sunday dinner along with her dissolute, sponging brother, the finishing school’s seven pupils dive into action to both preserve their school — and to investigate who wanted widowed Constance Plackett and her brother Aldous Godding dead. Each of the girls — Smooth Kitty Heaton, Stout Alice Brooks, Dear Roberta Pratley, Dull Martha Boyle, Dour Elinor Siever, Disgraceful Mary Jane Marshall and Pocked Louise Dudley — and even their intrepid Spaniel pup, mischievously also named Aldous — play a part in solving the mystery, relying on their various talents and proclivities. Equal parts farce and thriller, The Scandalous Sisterhood of Prickwillow Place will make readers relish every page. Author Julie Berry expertly captures the exact tone of voice of a Victorian “horrid novel” (what we’d call a Gothic novel nowadays) while portraying seven girls who, despite everything, are willing to risk it all to stay together as a family. The many twists and turns make this novel the best sort of roller coaster ride. Highly, highly recommended. And for those of you lucky enough to enjoy The Scandalous Sisterhood of Prickwillow Place as an audiobook, Jayne Entwistle’s narration positively lifts this book to new heights. I just wish I could give it six stars! Ridiculous and fun. A group of boarders at a Victorian finishing school conspire to hide the bodies when their headmistress and her brother drop dead suddenly. It's a romp. They solve the mystery and all the girls who are old enough meet proper beaux, and everyone who is still alive in the end lives happily ever after. There are a few moments when the silly plot and the seriousness of death rub uncomfortably against each other, but mostly it's just a hoot. Recommended by Natasha and me. "Eine skurrile Krimi-Komödie mit viel schwarzem Humor"
Diese Beinamen behalten sie auch w "Eine skurrile Krimi-Komödie mit viel schwarzem Humor"
Diese Beinamen behalten sie auch während der Geschichte bei, was anfangs etwas gewöhnungsbedürftig war, aber dadurch konnte ich die Mädels auch von Anfang an sehr gut auseinander halten. Durch eine gewitzte Vorstellung mit ein paar Sätzen über die Familien der Mädchen erfährt man auch, warum sie sich diesen Spitznamen verdient haben. Alle sieben gehen auf das St. Etheldra Mädcheninternat in dem kleinen, englischen Städtchen Ely im Jahr 1890. Ohne großes Vorgeplänkel stehen sie dem Tod ihrer Schulleiterin und deren Bruder gegenüber, doch statt dass sie die Polizei benachrichtigen, beschließen sie kurzerhand, die Leichen verschwinden zu lassen. Schließlich könnten sie dann tun und lassen was sie wollen und hätten endlich ihre Freiheit und wären keinen gesellschaftlichen Zwängen unterworfen. Aber schon im nächsten Moment klingelt es an der Haustür und von da an kommen den Mädels unentwegt Schwierigkeiten in den Weg, die ihren Plan jederzeit auffliegen lassen könnten. Außerdem kämpfen sie noch mit dem Verdacht, dass eine von ihnen für den Tod der beiden Erwachsenen verantwortlich sein könnte - oder noch schlimmer: der Mörder draußen frei herumläuft. Unglaublich erfrischend geschrieben und dem Stil des 19. Jahrhunderts angepasst. Julie Berry schreibt aus der auktorialen Perspektive, lässt aber zwischendurch auch mal die Gedanken des ein oder anderen Mädchens einfließen. Die Mädchen sind (schätze ich) zwischen 12 und 16 Jahre alt und es ist ein wahres Vergnügen sie dabei zu beobachten, wie sie mit Verstand und einer großen Portion Glück versuchen, den widrigen Umständen auszuweichen. Sämtliche Steine werden ihnen dabei in den Weg geworfen und sie kommen kaum zur Ruhe, um einmal zu verschnaufen. Dabei kommen auch ihre vielseitigen Ambitionen zum Tragen und so müssen sie sich im Nachweisen von Giften, Vortäuschen falscher Tatsachen und Ermitteln kriminalistischer Spuren beweisen, dass ihnen auf eine höchst reizende, und mit schwarzem Humor getränkte Weise gelingt. Zum Schluss muss ich das Cover noch erwähnen, denn nur deshalb bin ich auf diese fantastische Geschichte aufmerksam geworden. Es strahlt genau das aus, was man im Buch erwarten darf: eine Bande zu allem entschlossener junger Damen, die in ihrer Improvisationskunst zu allem bereit sind, um zusammen zu bleiben. Eine wunderbar unterhaltsame Geschichte über sieben Mädchen, die um jeden Preis ihrer Familie fernbleiben wollen, denn diese haben sie bei sich selbst gefunden. Mit viel Witz und Charme haben sie mein Herz erobert und ich bin sicher, dass sie das auch bei jedem anderen Leser schaffen werden. Ein Highlight für mich und ein absolutes Lesevergnügen! This quaint novel tells a story of a British boarding school in the end of the 19th century. But saying that and only that would be a gross simplification. The story is also a murder mystery and a farce, a historical and a study in character interactions. One day, seven teenage girls, the students of St. Etheldred’s School for Young Ladies, witness their schoolmistress and her brother keel dead during their weekly Sunday dinner. Why did they die simultaneously? Were they murdered? Why, how, and This quaint novel tells a story of a British boarding school in the end of the 19th century. But saying that and only that would be a gross simplification. The story is also a murder mystery and a farce, a historical and a study in character interactions. One day, seven teenage girls, the students of St. Etheldred’s School for Young Ladies, witness their schoolmistress and her brother keel dead during their weekly Sunday dinner. Why did they die simultaneously? Were they murdered? Why, how, and by whom? And most importantly: what is going to happen to the girls? For various reasons, none of them wants to go back home. 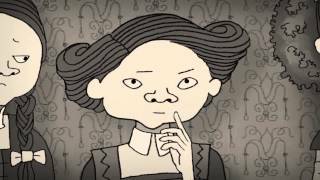 To avoid such a fate, they concoct a convoluted scheme to conceal the unfortunate deaths and pretend that their schoolmistress is still alive. And they plan to investigate her suspicious demise. Only inexperienced children, together with Julie Berry, their author, could ever come up with such an outrageous plan, and of course, everything goes awry. Unexpected visitors arrive on their doorstep, one after another, asking awkward questions and demanding to see their mistress. Money problems unfold. Robberies happen. Lies pile up. Obviously, covering up a double murder is not for wimps. Still the girls persevere and almost pull it off. Despite their internal squabbles and petty rivalry—and what company of seven teenage girls could exist without those—they manage to work together fairly well. They wash clothes and bury corpses, solve murders and confront problems, always supporting each other along the way. The plot gallops, with new complications arising hourly, according to the Murphy’s Law. Such a tale would be ridiculous without humor. Fortunately, there is plenty of it. Not hilarity but mild amusement accompanies almost every page. The characterization is superb; every girl is different. Each has a distinctive personality and appearance, her own doubts and faults. The marvelous cover art and inside illustration by Iacopo Bruno contribute to the feeling that the girls are alive, a bunch from a local high school production rather than a genuine historical novel. A delightful read, well thought of and well executed. Definitely recommended. زمان داستان در دوران ویکتوریایی هستش که یه سری رفتار خاص از خانم ها مورد انتظار بود و خانواده های زیادی شرایط سختی رو تحمل می کردن تا دخترشان را به مدرسه های خارجی بفرستند. خواندن کتاب ابتداش سخته چون داستان هفت دختر مختلفه و به خاطر سپردن اسم هاشون و شرایط زندگیشون کمی سخته اما با گذر زمان، شناختن شخصیت ها ساده شد و داستان با سرعت مناسبی پیش رفت. پلات اصلی راجع مرگ غیر منتظره ای در زمان شام در مدرسه هستش. توصیفات زیبایی داشت و از ابتداش تا انتها افت چندانی نداشت و زیبا پیش میرفت. سرعت پیشرویش هم زمان داستان در دوران ویکتوریایی هستش که یه سری رفتار خاص از خانم ها مورد انتظار بود و خانواده های زیادی شرایط سختی رو تحمل می کردن تا دخترشان را به مدرسه های خارجی بفرستند. Очередная утомительная и ничем не примечательная трапеза в школе для девочек имени Святой Этельдреды закончилась весьма странно. Директриса вдруг ни с того ни с сего закашлялась, словно подавилась, и упала замертво. А следом точно тем же способом скончался и ее мерзкий (по мнению воспитанниц школы) братец, также присутствовавший за столом. Какова вероятность, что два человека с интервалом в минуту могут так глупо умереть, подавившись, к примеру, кусочком мяса? "Отравление!" - решают девочки и не Очередная утомительная и ничем не примечательная трапеза в школе для девочек имени Святой Этельдреды закончилась весьма странно. Какова вероятность, что два человека с интервалом в минуту могут так глупо умереть, подавившись, к примеру, кусочком мяса? "Отравление!" - решают девочки и не спешат звать на помощь. Во-первых, в убийстве вполне могут обвинить одну из них. А во-вторых, смерть директрисы означает возвращение домой, а домой не хочется никому. Каждую ждет либо злая мачеха, либо противные братья, либо не менее противная тетушка... В общем, уж лучше здесь, с теми, кто стал сестрами. Пусть ради этого и придется скрыть смерть директрисы и закопать пару трупов. Мне очень понравился роман, хотя сомневаюсь, что он подходит для своей целевой аудитории. Сюжет порой предсказуем, но героини получились такими яркими и разными, что только наблюдая за ними можно получить немало удовольствия. Чего стоит хотя бы вступление, где автор в весьма насмешливой форме рассказывает, как каждая из учениц угодила в школу. И каждая из этих маленьких историй затем отражается в именах героинь. Точнее не в самих именах, а в прилагательных перед ними: Disgraceful Mary Jane, Dour Elinor, Smooth Kitty, Dull Martha, Dear Roberta, Pocked Louise, Stout Alice. The story is told as a complete farce. I mean..literally speaking! Conceptually speaking, this deserves a five star rating. So why didn't I enjoyed reading it, more than I did? While this has its bright moments, and moments of pure witticism, I couldn't get into its rhythm...or maybe that is the problem: Its lack of rhythm, especially regarding the story's first half. The fact that the author decided to give us some basic character information of our leading seven main characters by simply associating some traits to them, and then later on, simply vocalize a constant (and boring!) stream of adjectives to their names, was for me the story's weakest point. Pocked Louise opened her mouth to correct Dull Martha, but Smooth Kitty shook her head slightly. Pocked Louise, the youngest of the girls, was accustomed to her older schoolmates bossing her. She kept still. Dear Roberta covered her face with her hands. To say that I had a really hard time with phrases such as it, would be putting it mildly. By the second half of story I did however became more accustomed to this peculiar format _or maybe I just started ignoring it _ so I could start and appreciating the writing a little more, without having to stop to figure out which character I was now reading about. The problem with a farce _at least as far as I see this _ is that by given us these stereotyped nineteen century characters, all of the girls voices somewhat sounded the same. Yes, their interests were all very varied, but feeling that if it weren't for the adjectives used to identify them, I wouldn't know how to proper differentiate them, was not a good feeling. For instance, what were the chances that seven girls with apparently so different personalities would act so blasé in the face of not one, but two murders? Yes, I remember that this is a farce, but I can't help feeling that the only thing it managed to do _in the beginning_, was to portray the girls somewhat as sociopaths. This was all during the infamous first part of the book. “You sound proud of it,” Elinor observed. “Why shouldn’t I be?” Louise flipped through the pages of her notebook. “I don’t condone killing, but if killing happens anyway, then I think women go about it much more sensibly. Leave it to men to be loud and violent and messy about the business. Also, the girl who is too good for her own good.. The one who would like to go to university.. The one who rather enjoys different things.. Bury the corps, and pretend as if nothing had happened. Making out....nineteen century making out!! Hand kissing! What happens here to redeem the story for its strange "characters characterization", is that this is a very complete farce in which apparently joking, the author manages to give us an in depth look at what it meant to be a girl in the nineteen century, and how the rest of society perceived her. Do I intend to re-read it? In a near future I don't think so. Also this was so quirky and different, that unlike what happens with most books, I don't think I will be forgetting this one so soon. But who knows, maybe in a couple of years I will be more adept to this type of storytelling. I cannot say that it does not have its merits. I really enjoy a good murder mystery. I grew up on Sherlock Holmes, a little bit of Alfred Hitchcock’s mystery anthologies here and there, and Agatha Christie adaptations, particularly Poirot and the beloved Miss Marple – some better than others. Do not get me started on the particular series that features Miss Marple as a patient, innocent bystander, replete with yarn and needles and some kind young man or other that actually gets the job done. In any case, I am particularly smitten if there is something afoot, plenty of red herrings, and a smidgen of humor to tie everything together. So it might be a bit of a mystery in itself why The Scandalous Sisterhood of Prickwillow Place was allowed to languish on my shelf for a good few months pre- and post-publication. I…honestly have no answers for you right now. I can definitely tell you that I regret said languishing and I might very well make up for it in the future with a re-read or two. But let’s talk about what makes me regret said languishing, and why you shouldn’t make the same mistakes. The Scandalous Sisterhood is comprised of several girls who were endearing to me from the onset and quite beloved at the conclusion: Dull Martha, Smooth Kitty, Poxed Louise, Disgraceful Mary Jane, Stout Alice (my personal, absolute favorite), Dear Rebecca and Dour Elinor. The little monikers at the beginning of each name was a little confusing at the beginning, but once you’re headlong into the story, it helps to know which girl will react which way – and it also rather adds to the humor of it all. So. Our fair and often aptly nicknamed heroines are away at boarding school, under the eye of a rather disliked headmistress and her boor of a brother. And then, one night at dinner, both of them drop dead. The meal was poisoned. There is a murderer among them. Now, in normal society, the proper thing to do (one would hope) is to call the authorities and possibly the local media if you really want a circus, and step back. But Smooth Kitty proposes something different. They conceal the evidence, pretend as though everything is absolutely fine, and find out the murderer for themselves. And so the mishaps begin. This is my first time reading anything of Julie Berry’s, and I must say that she has a particular talent for engrossing, often wry prose and appropriately paced capers. My eyes didn’t wander. There were no pointless drops in mood after a particularly tense scene and no unnecessary love interest (and rare as it is for me to say this, yes – the older girls’ love interests were very, very necessary). I’d give the entire mechanics of the novel a good A+. This is definitely on the middle grade scale of things, but I think it has pretty good crossover appeal if you like a quaintly written, good old-fashioned free-for-all. Also, a book where all the girls involved in a scheme are friends, genuinely care for each other and look out for each other’s well-being! How very, very refreshing! My only bone to pick, if anything, is the fact that I’m personally still blinking over the ending. One of the tapped criminals did not make sense in the grand scheme of things to me. In any case, I noted last night that I feel the morbid undertones would be of particular appeal for Tim Burton or Laika Studios to consider an adaptation. I don’t know how to make this happen, but considering that Laika has a particular eye right now for children’s books (have you heard the good word about the Wildwood option? ), I am crossing my fingers that eventually, the Scandalous Sisterhood might fall in the right hands to make that come together. I thought this book was super-fun! Mysterious deaths, secret fortunes in doubloons, girls in disguise – what more can you want from a boarding school book? It took some time for me to finish this book, not because it is bad far from it just simply LIFE getting in the way. Finished the last 80 pages this morning, and I like what they did with (slight spoiler) Caramel boy, fun aspect they went with. Also I love how rich this book was, midway you really really want it to be a series but by the end you felt it was good as a standalone as well. Companion books would be welcome, but sequels are not nessesary in this case. This book is funny, fun, scary, mys It took some time for me to finish this book, not because it is bad far from it just simply LIFE getting in the way. This book is funny, fun, scary, mysterious, unpredictable, great characters and setting. So, I have a mixed feeling for this book. Because I like it a lot, but I also feel a bit bored in some part. - The twist was great. - The last parts of the books are really tense & good. - The mood & atmosphere in this book are "gloomy" which is why it's perfect to read on rainy days. But there are some part of the book that is just feel plain. It was So, I have a mixed feeling for this book. Because I like it a lot, but I also feel a bit bored in some part. But there are some part of the book that is just feel plain. It was quite slow until the 40% before the book finish. Anfangs bisschen schwer, die vielen Mädels auseinanderzuhalten (die Sache mit den Adjektiven machts nicht unbedingt einfacher) und die Geschichte kommt erst mit der Zeit so richtig in Schwung. Dennoch eine sehr unterhalsame lustige Lektüre, welche gleichzeitig auch ein kleiner feiner Krimi ist. 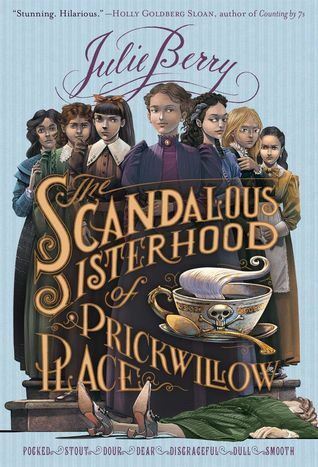 The Scandalous Sisterhood of Prickwillow Place was the sort of middle grade novel I simply had to read. Mostly because I snicker every time I read the word “prickwillow” because I’m a very mature, grown up sort of person. Not to mention the fact that historical novels are fabulous and scandalous girls are generally pretty fun. Who wants non-scandalous heroines? If I want to read about boring girls who make boring choices, I For more reviews, gifs, Cover Snark and more, visit A Reader of Fictions. The Scandalous Sisterhood of Prickwillow Place was the sort of middle grade novel I simply had to read. Mostly because I snicker every time I read the word “prickwillow” because I’m a very mature, grown up sort of person. Not to mention the fact that historical novels are fabulous and scandalous girls are generally pretty fun. Who wants non-scandalous heroines? If I want to read about boring girls who make boring choices, I could write a book about my childhood. The Scandalous Sisterhood of Prickwillow Place is every bit the “rollicking farce” promised in the book’s blurb, and it was an utter delight. Farces are not everyone’s tea and scones. Frankly, tea and scones are not my tea and scones. The Scandalous Sisterhood is utterly madcap and ridiculous. If you like things to be neat and orderly and realistic, this book will seem like a bit of silliness and be frustrating. Personally, I don’t so much mind my books not making a lick of sense so long as they’re doing so intentionally. The book opens with the death of the indomitable Mrs. Plackett and her brother, Mr. Godding. The girls of the school then decide that, rather than risk being sent to their various homes, they will pretend that nothing is amiss, so they bury them in the garden. It’s obvious from page one that this will not work out as planned, but it sets a hilarious romp in motion and I am all for it. Serious mysteries often fail to capture my attention, but I was totally on board for everything happening in The Scandalous Sisterhood. The characters, though not fully fleshed out, are more developed than the adjectives attached to their names might indicate. There’s more to Smooth Kitty than her smoothness, to Dull Martha than her lack of intelligence, to Disgraceful Mary Jane than her flirting. The character names are often said in conjunction with their adjective, and, though not my favorite aspect, it also did help keep the girls separate in my head. I think it also beautifully highlights the reasons that these girls have been shipped off to St. Etheldreda’s School for Girls by their families; they’ve been cast as one-dimensional and not worth keeping about. The course of the book shows how much more there is too them. The best surprise of The Scandalous Sisterhood was the shippiness. I totally do not expect a lot of shipping in my middle grade novels. Actually, I think The Scandalous Sisterhood sits on the border between middle grade and YA, and that YA readers should consider this too, even if they don’t generally do middle grade. Most of the girls get a ship of some sort. It’s also nice that not all of them sail, so it’s not a total pairing off. I think my favorite was the hilarious pairing of Dour Elinor with a young man who excels in the funerary arts. The romance isn’t the largest element, but I super appreciated it being there. I actually received a print ARC of The Scandalous Sisterhood as well, but, due to all the BEA books, I didn’t manage to get to it in time. Then I had the option of the audiobook, and I could not resist. This was a most excellent choice, though I’m positive the book is just as much fun in print. Jayne Entwhistle fulfills my three main qualifications for an excellent narrator: 1) she’s completely willing to be silly, 2) she does a fabulous job with voices, and 3) she’s British. This audiobook was such a pleasant way to pass the time. I'm a fan of Julie Berry, but I wasn't much a fan of this book. It took me 150 pages to get into it (that's like the first half of the book x_x) and during those 150 pages I debated dropping it but I'm glad I pushed through because the last half of the book was great!! The synopsis and the title was what intrigued me. The headmistress and her brother drop dead during dinner and these 7 young girls are determined to maintain their freedom. No one wants to go home, and this is their chance to fi I'm a fan of Julie Berry, but I wasn't much a fan of this book. It took me 150 pages to get into it (that's like the first half of the book x_x) and during those 150 pages I debated dropping it but I'm glad I pushed through because the last half of the book was great!! The synopsis and the title was what intrigued me. The headmistress and her brother drop dead during dinner and these 7 young girls are determined to maintain their freedom. No one wants to go home, and this is their chance to finally be free from restraints and etiquette and to finally be themselves. I enjoyed how the girls pulled it together and just buried the two corpses in the back garden. lol, I guess maybe my morals are kinda twisted xD I admired how the girls wanted to be themselves, and fought so hard to maintain the farce that everything was fine at their school. -Dour Elinor is obsessed with death so this is all great for her (she was my favorite character). -Dear Roberta is just a sweet thing who finds this all difficult to deal with. -Pocked Louise is the chemist/scientist with the brains. -Smooth Kitty is the calculative one. The book starts and ends with her really. She's the one who came up with the plan to try to stay together in the first place and she's the one most burdened in the end. -Disgraceful Mary Jane is the beauty and the flirt. -Dull Martha is pretty dumb, but she has a few talents. -Stout Alice is an actress-to-be. She may not be beautiful like Disgraceful Mary Jane, but it's because of her acting that the plan lasted as long as it did. (wow, I remembered them all from the top of my head xD) I guess with funny character names like that, they become a bit unforgettable. I definitely loved the end- it was a mystery who-dunnit that is brilliantly solved. St. Ethelreda's is a very small school for young ladies held in Mrs. Plackett's house. There are only seven students. all of whom would much rather be with the querulous headmistress than with their own dysfunctional families. When Mrs. Plackett and her brother, Mr. Godding, drop dead after eating veal, the girls, especially Smooth Kitty (all of the girls have adjectives attached to their names, like Dour Elinor and Disgraceful Mary Jane), decide that the best plan of action is to bury both of t St. Ethelreda's is a very small school for young ladies held in Mrs. Plackett's house. There are only seven students. all of whom would much rather be with the querulous headmistress than with their own dysfunctional families. When Mrs. Plackett and her brother, Mr. Godding, drop dead after eating veal, the girls, especially Smooth Kitty (all of the girls have adjectives attached to their names, like Dour Elinor and Disgraceful Mary Jane), decide that the best plan of action is to bury both of the adults in the garden and continue on as if nothing has happened. This excellent plan would have gone off without a hitch had people not arrived that very night for a surprise birthday party for Mr. Godding. The story is created that a nephew of the pair is sick in India, and Mr. Godding has taken off forthwith to be with him, thus sending Mrs. Plackett to bed with a horrible case of vapors. Soon, Stout Alice is recruited to impersonate Mrs. Plackett, but villages tend to be such nosy places, and the girls have a lot of trouble keeping up their ruse. Eventually, after more murders are committed, they find the perpetrator to be an unlikely person working from an inconceivable set of motives. Strengths: This is a very effective period mystery, well researched and clever. With the renewed interest in the history of any sort of Victorian-ish setting, this could find some readers, perhaps more in high school for this particular book. So maybe this is more of a 4 star than a 5 star book...but I will be honest, I had so much FUN listening to it that I don't even care! This book seriously exceeded expectation! When their headmistress and her odious brother are suddenly poisoned, the students of St. Etheldreda's School for Girls have a decision to make. Do they alert the police and return to their respective homes, or carry on as if nothing happened? They opt to bury the bodies. Unfortunately, hiding murder is not easy, especial So maybe this is more of a 4 star than a 5 star book...but I will be honest, I had so much FUN listening to it that I don't even care! This book seriously exceeded expectation! When their headmistress and her odious brother are suddenly poisoned, the students of St. Etheldreda's School for Girls have a decision to make. Do they alert the police and return to their respective homes, or carry on as if nothing happened? They opt to bury the bodies. Unfortunately, hiding murder is not easy, especially when the murderer is still at large! But who on earth wanted Mrs. Plackett and her brother dead? This really was a fun, farcical tale of murder, mayhem, and most inconvenient situations. A great part of the book's charm comes from the 7 main characters, the students of St. Etheldreda's School for Girls. Especially because I was listening to it on audio book, I was sensitive to how many of them there were and I was worried I wouldn't be able to keep track of them. However, the author does a wonderful job making each one distinctive and memorable by using an adjective with their name (i.e. Smooth Kitty, Stout Alice, Dour Eleanor, etc.) After the first chapter, I had no problem figuring them out. I loved how the book threw all sorts of random packages and notes and weird, incidental moments into the first few chapters and then slowly unpacks each one to develop the story further. The murderer was somewhat obvious but it was still fun piecing together the clues of how everything comes together. There is even a touch of romance! There is not one thing I disliked about this book. But instead of long paragr At a school for girls, on a Sunday night during dinner, the headmistress and her brother drop dead after taking a few bites of a delicious veal. The girls at the school having no love for the poor souls came up with a shameless plan to hide the deaths and go on with their lives at the school. Unfortunately for them things didn't work out as planned including the possibility of the murderer returning for its next victim. This book took awhile to get started for me. I wasn't sure what I thought of all the girls having their defining trait tacked onto their name the whole time - but I did find it a useful device to help remember who was who, so there's that. It was interesting to watch the girls interact together, and it was nice that there weren't any typical mean girl tropes or anything. They all had different personalities and didn't always approve of each other, but they also got along in their way. The mystery itself was interesting - but also seemed almost secondary for large parts of the story, as the girls were more wrapped up in the running of the place and also their various personal pursuits. Also, it had some farcical aspects - and it reminded me of Don't Tell Mom the Babysitter's Dead a little bit - but I wouldn't say it was remotely "hilarious" despite the blurb on the front of the book. I'm not sure I'd say it was even particularly funny. Mostly, I thought it was cute, and maybe a little sweet. I thought the ending was handled well, though, and it really kicked into gear and got interesting in the last quarter of the book. The resolution ended up being fairly interesting - at least a bit more interesting than I was expecting from the set-up. Overall, a cute sort of cozy mystery with shades of boarding school stories and cute little side romances. This delightful Victorian mystery involves seven schoolgirls who upon the sudden and unexpected death of their headmistress and her repugnant brother decide to cover up the deaths and live on in blissful solidarity without any interference from their families, thus free to live their lives as they choose. The girls embark on this plan of action without reckoning for the nosy neighbors, officious investigators, questionable domestic help and, of course, the murderer. It is delightful and was an unanticipated pleasure to read. I knew who Julius was upon his first meeting Louise, so no surprise there. I was so pleased with how all the girls were handled. We never get any in-depth background for any of the girls, just the brief overview in the beginning and any comments Kitty makes about her home life, but the eagerness of the group to stay together speaks volumes. Each girl is unique and has her own strengths and foibles. The way the burgeoning romances and attractions were handled was excellent. “I don't condone killing, but if killing happens anyway, then I think women go about it much more sensibly. Leave it to men to be loud and violent and messy about the business. It's egotistical of them. It's not enough to eliminate their enemy. No. They must conquer them face to face and watch them plead for mercy, whereas women dispatch victims quickly and silently." "Men might say poison isn't sporting."